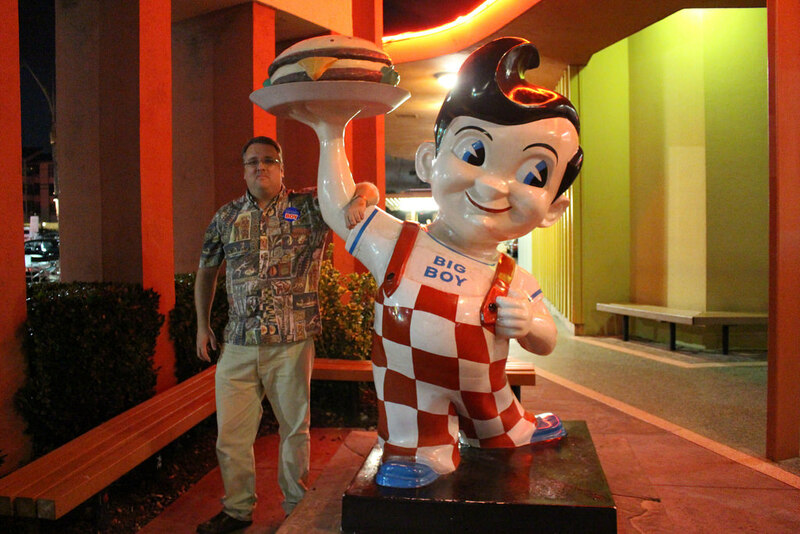 Bob's Big Boy, quite literally, gave me my first vision of what the world was like. I was born legally blind, but nobody (including me) knew it for a while. Unintentionally, I disguised the problem behind surprisingly effective coping mechanisms. And of course I didn't know that vision COULD be anything other than a haze of fuzzy shapes and colors. So I had not complaints. I was three when the problem was identified. My mother was *horrified* that she hadn't caught the problem earlier, even though the pediatric ophthalmologist told here there was no way she could have done so. 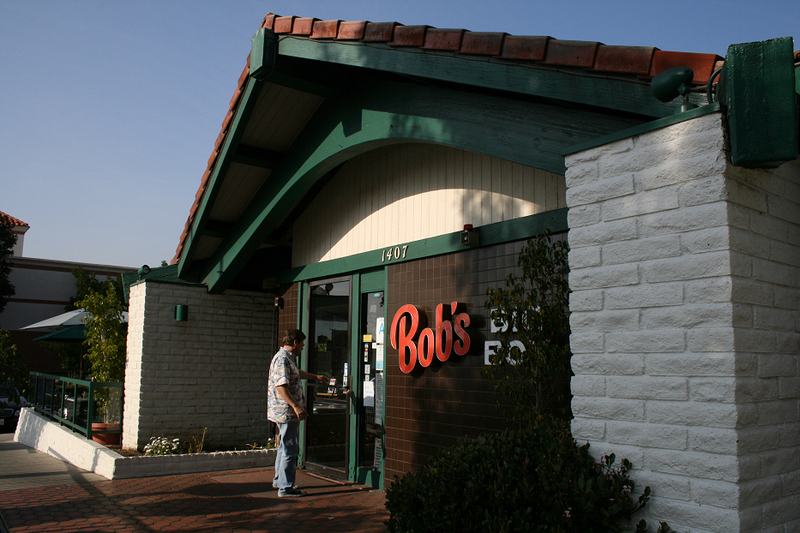 An example of Bob's "Chula Vista" building design. This one in L.A. When the big day arrived, my parents and I drove down to El Toro (that's Lake Forest to carpetbaggers) to pick up my very first pair of uber-thick prescription glasses, which would (and still do) correct my vision from horrible to 20/20. We immediately went just down he street to Bob's Big Boy for lunch. 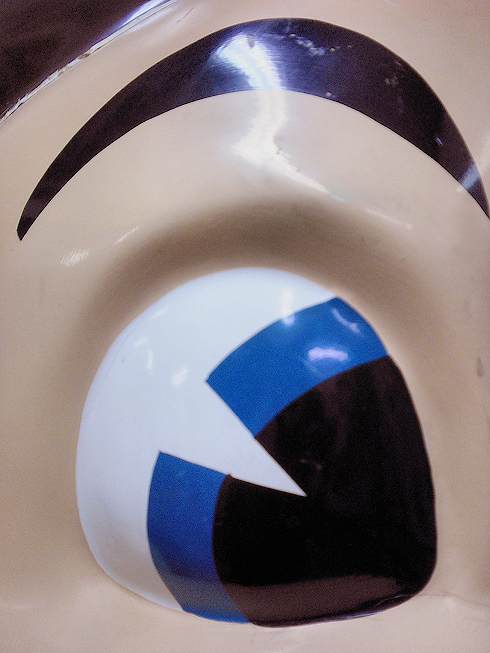 There -- unlike the short ride over in the backseat of my parents' Olds Cutlass -- I could finally SEE something! In fact, I could see EVERYTHING! We'd been to identical Bob's restaurants many times before. It was one of architectal firm Armet & Davis' earthy "Chula Vista" designs for Bob's, which combined the design genius they'd perfected in earlier googie coffee shops with a strong theme of Early California and the Western Ranch House. But every detail was new to my eyes! The first clear visual impressions I had were of my parents, subtropical plantings, a big George Nelson clock and benches, stained glass windows, "Spanish" wrought-iron light fixtures, decorative Lucite booth dividers, spacious Naugahyde booths, rotating racks of refrigerated desserts, and intriguing framed art depicting the vaqueros, dons and adobes of Early California. Every image was new and amazing to me. 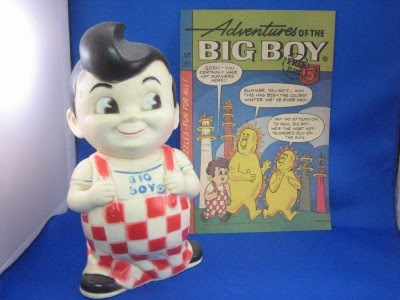 Bob's bank and comic book. The comics were dumb, but I always wanted one. I kept pointing out the simplest things to my mother, in awe -- Restaurant features I'd walked past dozens of times before and never noticed, like the simulated wood grain of the tabletops and the shiny metal air conditioning vents. "Look! Look! There are plants INSIDE the building!" Mom had tears in her eyes. But I was too busy LOOKING at EVERYTHING to notice. Leaving the restaurant after lunch, I noticed (also for the first time) the large outdoor statue of Bob and ran over to give him as big a hug as my three-year-old arms could muster. It was a ritual I would repeat many time in my early childhood, (and possibly a few times as an adult). 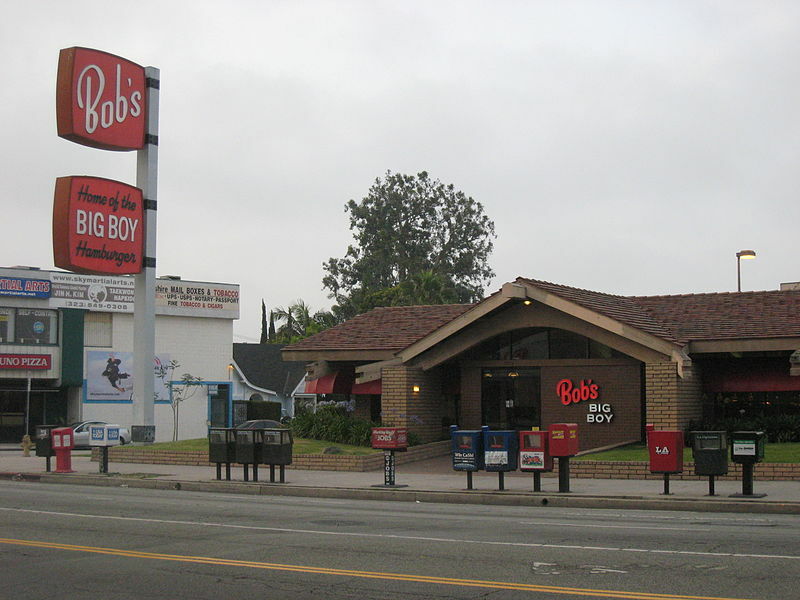 Phil Brigandi and I visiting a Bob's on Glenoaks Blvd, Glendale in 2008. Through dumb luck, I grew up surrounded by great architecture, including many gems by the Neutras: The Huntington Beach Central Library, Orange Coast College, the Mariners Medical Arts Building (where my pediatrician's office was located), and even a Neutra-knock-off elementary school. I regularly rode my bike past Schindler's Lovell Beach house and I enjoyed the breathtaking designs of Disneyland. 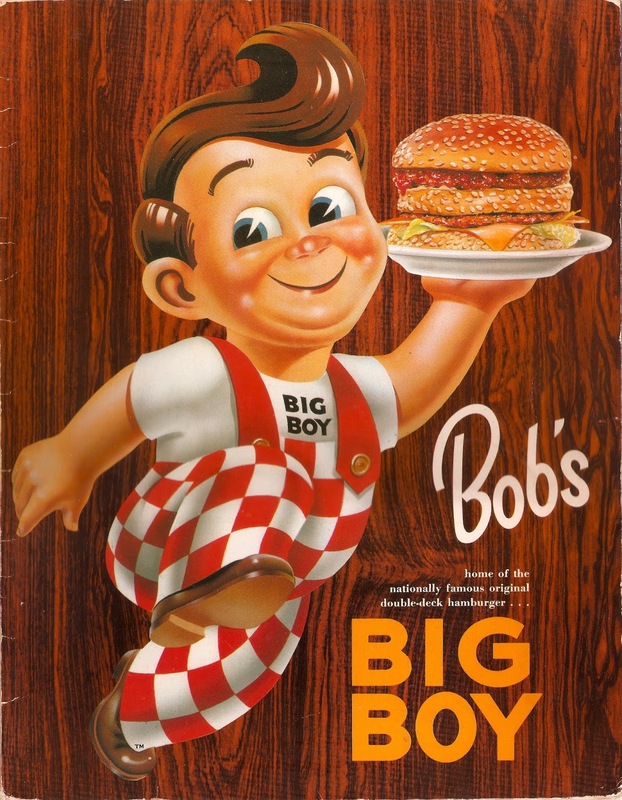 And of course I've been to restaurants with better food and service than Bob's. Even in its golden era, Bob's was never trying to be a fine dining experience -- just a top-notch coffee shop. 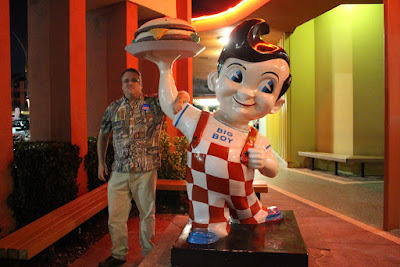 But still,... No building quite hits me emotionally like a Bob's Big Boy in original condition. Oh, I know the franchises are now inconsistent and sometimes disappointing. (The one in Orange deserved to close.) And they don't serve my favorite silver goblet milkshakes nor the julienned vegetable (with barley) soup I loved. But just being IN a vintage Bob's is always a bit of a happy homecoming. Can I trace my love of coffee shop architecture, double-deck burgers, colorful roadside signage, giant fiberglass advertising figures, and George Nelson clocks back to my first clear visual impressions? Can I trace my first step toward a career as a California historian to that moment? Well, it certainly didn't hurt.